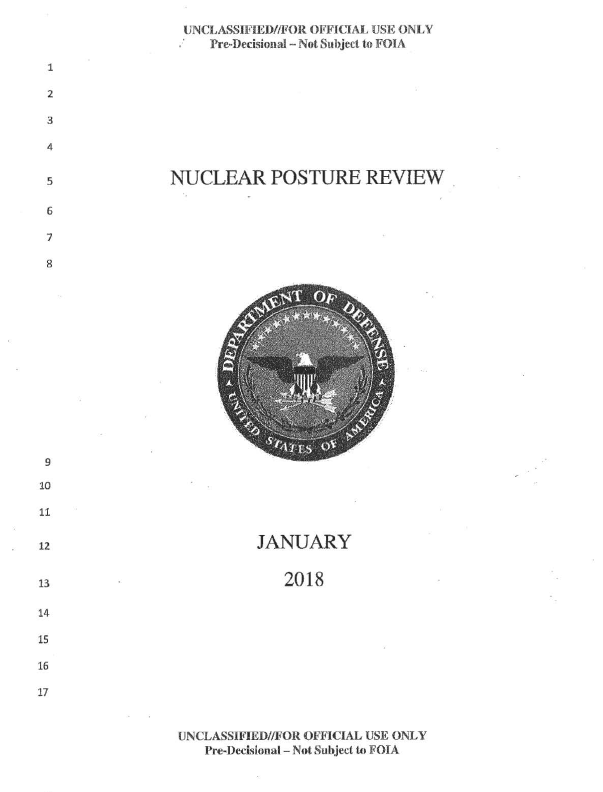 The following draft copy of the Department of Defense's Nuclear Posture Review was obtained and originally published by HuffPost. For decades, the United States led the world in efforts to reduce the role and number of nuclear Weapons. The 1991 Strategic Arms Reduction Treaty (START) set a ceiling Of 6,000 accountable strategic nuclear warheads — a deep reduction from Cold War highs. 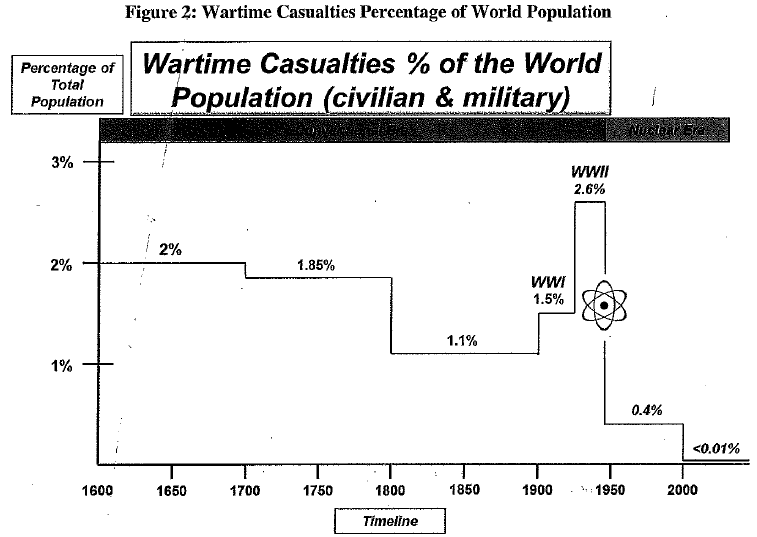 Shorter-range nuclear weapons were almost entirely eliminated from America’s nuclear arsenal in the early 1990s. This was followed by the 2002 Strategic Offensive Reduction Treaty and the 2010 New START Treaty, which lowered strategic nuclear force levels to 1,550 accountable warheads. U.S. nuclear weapons stockpile has been reduced by more than 85 percent from its Cold War high. It was a promising time. Many hoped conditions had been set for deep reductions in global nuclear arsenals, and, perhaps, for their elimination. These aspirations have not been realized. America’s strategic competitors have not followed our example. world is more dangerous, not less. While Russia initially followed America’s lead and made similarly sharp reductions in its Strategic nuclear forces, it retained large numbers of non-strategic nuclear weapons. Today, Russia is modernizing these weapons as well as its strategic systems. Even more troubling has been Russia’s adoption of military strategies and capabilities that rely on nuclear escalation for their success. These developments, with Russia’s invasion of Crimea and nuclear threats against our allies, mark Moscow’s unabashed return to Great Power competition. China, too, is modernizing and expanding its considerable nuclear forces. Like Russia, China pursues entirely new nuclear capabilities tailored to achieve particular national security objectives. At the same time, China is modernizing its conventional military, challenging traditional U.S. military superiority in the Western Pacific. Elsewhere, the strategic picture is no less bleak. North Korea’s nuclear provocations threaten regional and global peace, despite universal condemnation by the United Nations. Iran’s nuclear ambitions remain a significant concern. Globally, nuclear terrorism remains a constant threat. We must look reality in the eye and see the world as it is, not as we wish it to be. “This NPR realigns our nuclear policy with a realistic assessment of the threats we face today and the uncertainties regarding the future security environment. Given the range of adversaries, their capabilities and strategic objectives, this review calls for a flexible, tailored nuclear strategy. In nuclear deterrence, no “one-size fits all.” A diverse set of nuclear capabilities provides an American President with flexibility to tailor the approach to deterring one or more potential adversaries in different circumstances.